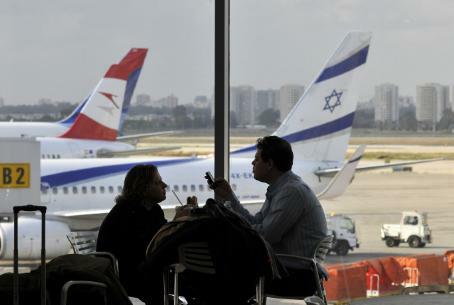 European authorities have blocked anarchists from joining the "fly-in" into Israel's Ben Gurion International Airport. European authorities are preventing some pro-Palestinian Authority Arab sympathizers from participating in the “fly-in” to Israel, at Jerusalem's request. Eight activists were prevented from boarding a Malev flight from Paris to Budapest, where they intended to pick up a connecting flight to Israel. Three other activists were already arrested at Ben Gurion International Airport on Wednesday. Earlier in the day two Dutch journalists were prevented from boarding an El Al flight from Amsterdam, although they claimed that they only wanted to cover the fly-in. They insisted that they did not intend to take part in demonstrations that have been planned to be held at the airport, and said they were not going to visit the Palestinian Authority. France also issued warnings about Israel taking steps to protect its security. In preparation for the international “fly-in” planned by European and American anarchists at BGIA Thursday night and Friday, Israel updated and dispatched a new “no fly” list to international carriers. The list carried 300 names of anarchists. According to international aviation regulations, airlines are not allowed to board passengers who are not welcome to enter a country due to passport, visa or other issues. Hundreds of security personnel have been deployed at BGA in anticipation of the arrival of the activists tonight (Thursday, July 7) and Friday. Meanwhile, the Tourism Ministry has other plans. According to a statement issued by the ministry Thursday, tourism officials at the airport will greet tourists with flowers and tourism information. “We need to maintain a sense of normality at the airport, sending out a message to the international press that Israel is a safe country and an attractive tourism destination,” said Tourism Minister Stas Miseznikov.